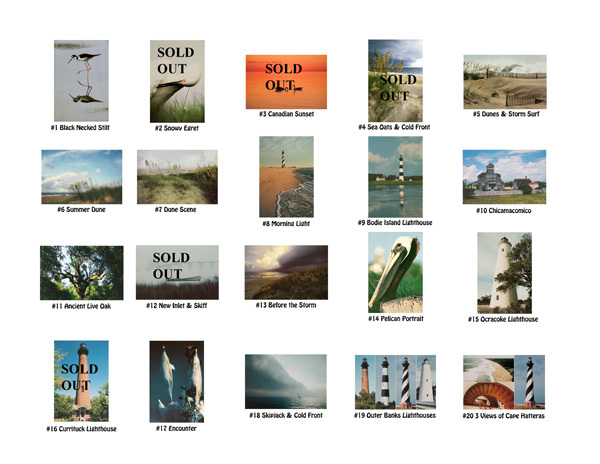 I have been selling my Outer Banks Note Cards since 1990. If you would like to place an order, please order by title or number. They measure 4¼x6 and retail for $2.00 each. Assortments of your choice in packs of 8 cards are $12.00. All are blank inside and come with envelopes. Please call or email me for more details and availability. Can you tell me how I can order 25 cards with envelops of number 6, 9, 31, 32? I couldn’t figure out to do it on the internet site, so can you please help me with an order? Did you get my private email? Michael, Your work is “the best”..spiritual for me! 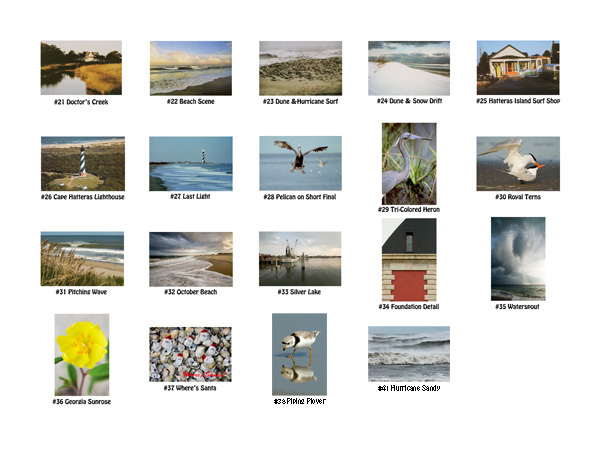 I picked up a pack of your note cards @ Pea Island and must have more! I too need to know how to order. #11-2, #13-6 #5-4 #21-4 #22-4 #32-8 #35-2. I know, a little crazy I guess. The “October Beach”, what would be the cost of the print? Thanks for your assistance. I’m looking to order some note cards . . . How do I do this? Is there a website where I can buy your note cards online? I was at Cape Hatteras Lighthouse recently and you had one of the lighthouse with the moon behind it. I’d like to order those. Is that possible? I’ve enjoyed using your beautiful cards, and need more. I’d like 24 total. 6 each of #s 4, 5, 6 and 7. If you are sold out of any of those, then please substitute #22. If a second one of those is sold out, then please substitute #31. Let me know how to complete this transaction.